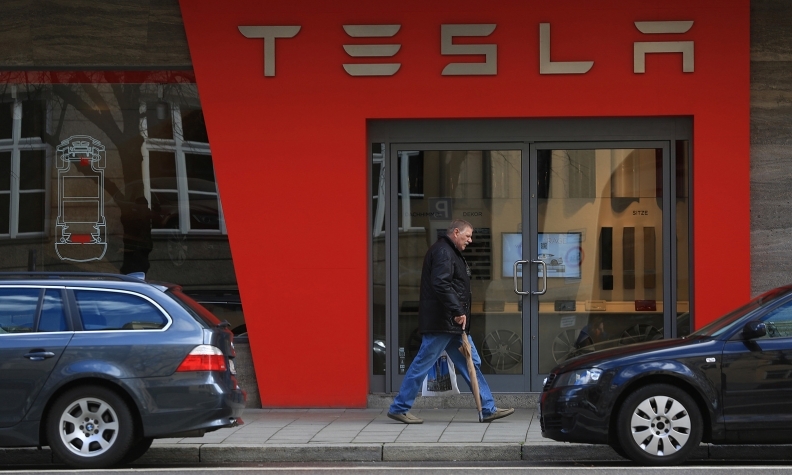 Tesla has hiked prices of cars sold in Europe by 5 percent to help offset the currency exchange hit. SAN FRANCISCO -- For Tesla Motors Inc., the Model X cannot come soon enough. The electric vehicle manufacturer’s net losses more than tripled to $154 million in the first quarter of 2015 as the company expanded into energy-storage batteries and invested in factory tooling for the Model X crossover’s third-quarter launch. Tesla reported $940 million in fourth-quarter revenue, up 51 percent from the first quarter of 2014. Measured using Tesla’s preferred non-GAAP accounting methods, first-quarter revenue rose 55 percent to $1.1 billion. Thousands of customers have placed $5,000 deposits on the Model X, which features a dual-motor all-wheel-drive system and “falcon wing” doors that rise vertically for easy entry. Speaking to analysts Wednesday, Tesla CEO Elon Musk said Tesla plans to let these customers configure their cars online starting in July. “We certainly have a lot of customers who have been waiting a long time,” Musk said, before adding that the Model X will be worth the wait. Musk said Tesla plans to ramp up production of the Model X twice as quickly as it accelerated output of the Model S sedan in 2012, which should help the automaker to become free cash-flow positive by the fourth quarter. He said Tesla also plans to unveil an early prototype of its Model 3 sedan in roughly March 2016, with a start of production slated for the end of 2017. The mass-market Model 3 will rely on batteries from the giant gigafactory that Tesla and Panasonic Corp. are building in the northwestern Nevada desert to double the world’s supply of lithium ion battery cells. Though the $5 billion factory is now under construction and is not slated to begin operating until next year, Musk said that Tesla is already thinking about expanding the plant by another 50 percent to meet demand for the stationary power-storage batteries that Tesla recently unveiled under the Tesla Energy brand. Since unveiling the batteries at an April 30 event in Hawthorne, Calif., Tesla has received 38,000 reservations for residential Powerwall batteries and 2,500 reservations for commercial Powerpack batteries – as many batteries as the company will be able to produce through the middle of 2016 based on its battery supply. Regardless of whether an expansion of the gigafactory happens, Musk said, Tesla will continue to prioritize cars over stationary packs when allocating batteries. In a letter to shareholders Wednesday, Tesla said it built 11,160 vehicles in the first quarter of the year despite starting production of the Model S’s all-wheel-drive 70D and 85D variants. Tesla expects to make 12,500 cars in the second quarter and deliver 10,000 to 11,000 cars to customers, keeping the Palo Alto, Calif., automaker on track to hit its goal of delivering 55,000 cars for the full year. The company’s automotive gross margins in the first quarter were 26 percent on an adjusted basis. Tesla forecast narrower automotive gross margins of “just under” 25 percent for the second quarter, in part because of the “significant” negative impact of the strong U.S. dollar. Tesla said it has hiked prices of cars sold in most European markets by 5 percent to help offset the currency exchange hit. The price increase applies to new orders delivered starting in the third quarter and will not impact the company’s second quarter results, Tesla said.